The impact of audio and video internet streaming is beyond dispute. Every TV maker offers consumers a line of Smart TVs using a variety of operating systems. For example, Vizio has SmartCast and Internet Apps Plus, Samsung has their Tizen Smart Hub, Sony has Android TV, and some TCL, Sharp, Insignia, Hisense, and Haier TVs incorporate the Roku operating system. The Smart TV operating system that LG has adopted is WebOS, which is currently in its third generation (WebOS 3.5). WebOS is a very comprehensive system that provides efficient and easy operation of TV, network, and internet streaming features, including access to an abundant list of streaming channels, and also includes full web browsing, just like what you can do on a PC. However, to make the WebOS platform even more efficient, LG has partnered Xumo to include a feature called "Channel Plus". Although the Xumo App is offered as an option some other branded TVs, LG included it as part of the WebOS (version 3.0 and up) core experience under the Channel Plus Label. It can also be added via firmware up to select 2012-13 LG Smart TVs running Netcast 1.0 through 3.0, as well as any 2014-15 models running WebOS 1.0 through 2.0. This includes LG's LED/LCD and OLED Smart TVs. Best of Channel Plus (IP-999) Shows the latest channel additions you may not know about. Here are the steps to follow in order to activate Channe Plus on a compatible LG Smart TV. Press Home on your TV Remote. If there is a notice that a new version or update is available, click on the update. The update may periodically provide new channels. Make sure that Channel Plus is set to ON. Click on the Channel Plus Icon on the WebOS Menu Bar. Navigating Channel Plus is easy. Instead of having to leave over-the-air (OTA) antenna channel listings to find these added channels in the apps selection menu, the channel offerings are mixed right in with a TV's OTA channel listings — thus the name Channel Plus. When users select the Channel Plus option, as they scroll through their broadcast channel listings, they will also see the added Xumo-provided channels listed in the same menu. This means that unlike cable/satellite, Netflix, Vudu, Hulu, etc..., over-the-air TV viewers don't have to leave the main channel selection menu to access the new internet streaming channels being offered. Of course, even if you receive your programming via cable or satellite instead of an antenna, you can still jump over to LG Channel Plus to access its streaming channel listings. On the other hand, for OTA TV viewers Channel Plus provides more seamless content access and navigation for TV viewers. This makes finding that favorite show or niche content easier and faster. Ever notice how much time you spend just finding a program instead of actually watching it? Although Channel Plus doesn't eliminate this entirely — it certainly helps. 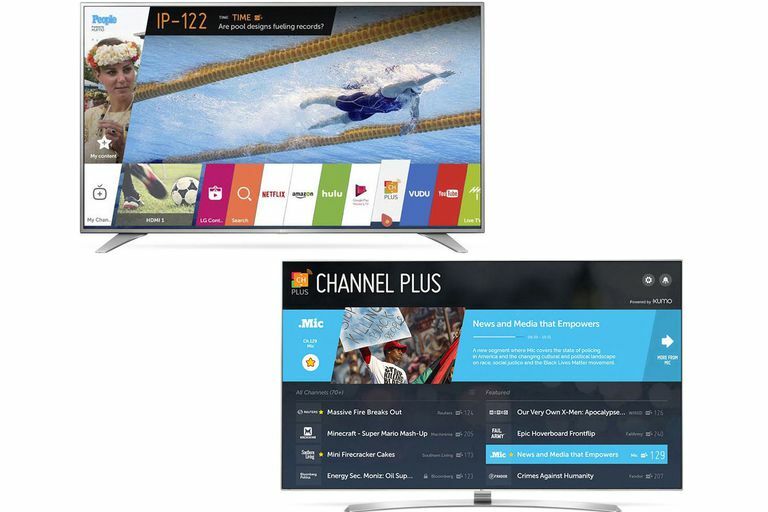 The LG Channel Plus feature is accessible directly from the main menu bar that runs along the bottom portion of the TV screen (see photo example shown at the top of the article). When you click on the Channel Plus icon, it takes to a full-page channel navigation menu. As you scroll through the menu, a brief description of each channel you highlight will be displayed in the top portion of the screen. You will also notice that each "channel" also has an assigned number which can also be used to access the channel if you don't want to scroll. In addition, you can also tag your favorite channels with a "star" so that they are easier to find. In all cases, when you find what you want, just click on it. Hisense/Sharp — 60 channels are available through the virtual input selection feature. Magnavox, Sanyo, and Philips Roku TVs and Roku Media Streamers — The XUMO App can be added on Roku media streamers and Roku TVs via the Roku Channel Store. Samsung — The Xumo App is available via the Samsung App Store. Vizio -— Available through Vizio TVs featuring Internet Apps Plus. Vizio also offers an additional alternative in partnership with Pluto TV that it refers to as WatchFree on 2018 models going forward. LG's partnership with XUMO is part of a continuing trend that blurs the steps normally needed to broadcast, cable, satellite, and internet streaming content. Instead of the consumer having to figure out what menu to go to find a specific content provider, it could all be included in one integrated list. In other words, where your programming comes from isn't the main concern - your TV should be able to access it and deliver it to you, without you trying to figure out where to find it. For best access speed and performance, LG/XUMO suggests an internet speed of 5mbps.